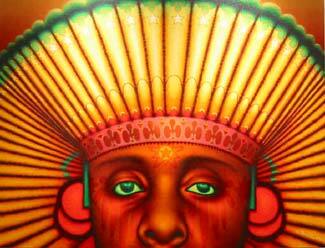 Ed Paschke appears at the Chicago History Museum through February 19th. The exhibition traces the stylistic shifts of Paschke’s prolific four-decade career, which took off in the late Sixties and came to an end only with the artist’s death on Thanksgiving 2004, at the age of 65. Paschke was born in Chicago, studied at the Art Institute of Chicago, and Chicago was where he lived and painted for most of his life. At the time of his death he was a professor of art history and theory at Northwestern University. The iconic Bigsby & Kruthers mural facing onto the Kennedy once featured Ed Paschke’s portrait painted alongside that of fellow city legend Michael Jordan. The first room of the Chicago History Museum’s exhibit half-attempts to recreate Paschke’s North Side studio, where a simulated window overlooks the orange brick mass of the Howard El depot. 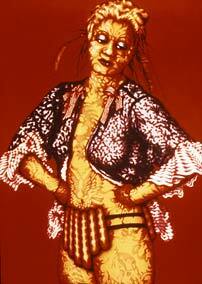 Paschke was a Chicagoan, through and through. It is a shame, then, that the Chicago History Museum seems inadequate to the task of curating a retrospective so ambitious in magnitude, of an artist so fascinating, unique, and important in the history of art in our city. A proper retrospective should try to say something, to express an idea or two about, for instance, what is happening on the canvas, how the artist may have interacted with the context in which he created, the influence of his contemporaries or prevailing developments in visual culture. The Chicago History Museum speaks to none of these. Aside from some shallow paragraphs here and there (those accompanying the decade-by-decade divisions of the exhibit printed in larger font) and some of the photographs used as anchoring themes in Paschke’s later fugues of color and design, the forty-odd paintings on display are basically left to fend for themselves, might as well be hanging in a commercial gallery. Fortunately, Paschke’s works are striking enough, lucid enough, to impress upon their observer a notion of what the painter was after, even in the absence of such critical enrichment. Your correspondent is writing today in order to urge that you do indeed visit this exhibit and get a kick out of it, though preferably on a Monday, when the Chicago History Museum is free. More can said about the inexcusable weakness of the Chicago History Museum, but here and now let us return to Paschke’s art. 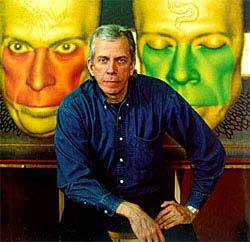 “Ed Paschke (June 22, 1939 - November 25, 2004) was an American painter. He was born in Chicago, where he spent most of his life. His childhood interest in animation and cartoons led him toward a career in art. As a student at the School of the Art Institute of Chicago he was influenced by many artists featured in the Museum's special exhibitions, in particular the work of Gauguin, Picasso and Seurat. Although Paschke was inclined toward representational imagery, he learned to paint based on the principles of abstraction and expressionism. Paschke received his bachelor of fine arts degree in 1961, and later his master of fine arts degree from the School of the Art Institute of Chicago in 1970. Between his graduate and undergraduate work Paschke traveled and worked a variety of jobs amassing the experiences that would shape his artistic style. During a brief period in New York, he was exposed to Pop Art philosophy and began to incorporate elements of this style borrowing images directly from the print media and other elements of popular culture. None of the work of these other Chicago Imagists appears alongside Paschke’s, though they are also mentioned, also anonymously, in the exhibit, and one wonders who they were and where they’ve got to. These early works include compelling, hand-painted takes on the Pop collage. “Dos Criados,”  exemplifies this style, juxtaposing photo fragments, pulp portraiture, kinetic Spanish text and promo-poster layouts to generate with studied technical precision a sense of seamy spectacle in imaginary cities of night. The untitled work hanging next to “Dos Criados” may be an event better realization of this stunning Pop sensibility, amplifying the sense of the eerie, that underbelly of the cosmopolitan, from which Pop Art draws much of its deeper charge. True to Paschke’s transformative New York Pop pilgrimage, much of the painting that follows Paschke’s first collage period seems an acid-inflected response to the music and lyrics of Lou Reed and the Velvet Underground, the screen tests of Andy Warhol. Fringe characters recruited from vague yet palpable circles of vice pose before the viewer, their bodies radiating psychedelic patterns, their skin grading into garish neon hues. 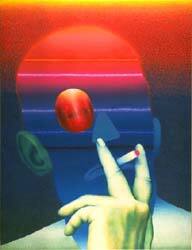 In 1990, the Art Institute of Chicago put on a major Paschke show. I remember attending the show with my family, a wide-eyed boy of six years. Paschke’s strange portraiture just sent me. The bizarre, moist eroticism of the women, the sci-fi boldness of the men- it stirred those dark waters wherein dwelt the mysterious eels of a child’s nascent sexuality. My parents bought a book of the retrospective to take home. I would sneak this book into the bathroom and there, with my clothes off, I would stare at the portraits of the women in secret, imagining my encounters with their subjects. 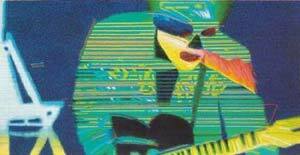 The later developments of Paschke’s style held no interest for me whatsoever. I was disappointed to find that few of those portraits were included in the current exhibition- at least not the ones I remembered. I searched the internet high and low for files of them and only managed to come up with a few, two of which- Rufus and Billy Jean  , are provided below. My favorite of the portraits on display at the exhibition was an untitled “painting of a friend,” an almost-middle-aged brunette woman with a full, healthy figure and charming if dissipated handsome looks. She wears a low-cut red- and white-striped gala dress and stands against a blaring hallucinogenic background pattern. All of this just fails to obscure the fact that while she is holding a cocktail in one hand, she seems to be _____ through her white mink wrap with the other. The exhibition presents one work that could be understood as the transition between Paschke’s earlier periods and that of his more original, definitive style. Two figures in formal attire depicted from the waist up occupy the foreground, backed by a cool, dim gradient haze. The psychedelic patterns which had heretofore served as background are now draped over their faces, now tightly enshrouded in tapestries that billow up into the air in surreal suspension, suggestive of an anonymous fetishism best coupled with a mind-altering experience, some solemn byzantine kink out of Eyes Wide Shut. From this point onward, the emergent geometries of the figure itself- the features of the face, the dimensions of the body- will become the subject of Paschke’s deconstructive studies in color, shape, and line. A very simple, very effective work in this vein is Fumar (1979) . Here, Paschke does not so much break the face down into its composite shapes as lay those shapes- a brightly colored, circle, oval, and triangle- directly over a ghostly facial armature whose original features, especially the eyes, remain faintly but definitely intact. The photograph off of which this painting is based, not shown in the exhibition, is of a German president taking a drag from a cigarette. Paschke’s inspiration for this colorful painting-over of the face was the luchador, the masked combatant in the Mexican wrestling tradition of lucha libre. The figure of the luchador and his mask appear as early as Ramrod (1969) - perhaps the first appearance of the man-gina in the history of the fine arts- and Paschke kept a small collection of these masks in his studio. Soon, Paschke turned from the masking of natural figures to an abstraction of the mask as a principle of shape and color. In the nineteen-eighties, Paschke’s human figures are electroplasmic emanations, what people on television would look like if you peeled away their skin to reveal the magnetism-made-light gleaming beneath. If the Impressionists, as some critics argue, were responding to photography, newly invented in the mid-nineteenth century, Ed Paschke can be counted among the disparate artists to respond to the advent of color television’s total ubiquity in American life, and later, to the development of computerized graphic design. 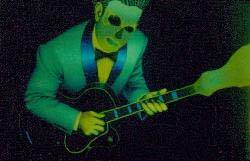 In Guitao , Paschke captures a fifties-era rocker hunched coolly over his guitar- a freeze frame from a televised performance at a time when that medium was newly a fixture of the American home- with the monochrome of early broadcasts giving way to electrified hues of blue, green, and yellow. The figure is distorted at its edges, beginning to merge with the tiny bright flecks of background crackle which remind the viewer that underneath this appearance is the meaningless chaos of pure signal, white noise. In this other untitled work  and in La Chanteuse , the televisual imagery is run through with the dyed striations of oscillating radio waves. TV People meld even further into a positronic soup without coherent boundaries, only unstable regions, fleeting puddles of ion. 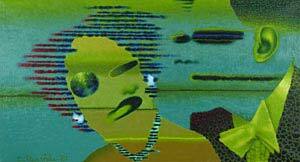 This period of denuded television on canvas was followed in the nineties by Paschke the painter’s riff on computerized manipulation of the image. This move, while legitimately addressing a major shift in the production of visual culture, ends up infecting Paschke’s paintings with the textureless vacancy of computerized art. All of the anxiety of his previous style is gone. Suddenly, we see a technically masterful artist producing works that look like he was playing around on Microsoft Paint. Elvis, George Washington, and the Statue of Liberty all get lo-fi desktop makeovers . These, while admittedly somewhat interesting, are such a far cry from the silk-screens of Andy Warhol in terms of their beauty, power, and intriguing visceral echoes that one is ready to condemn outright the digital revolution and return sublimely glad to the High Analog, that last moment in which material culture could be said to have had a soul. In the new millennium, Paschke fortunately got over the novelty of the digital and began to produce works representing a balanced synthesis of his previous periods. Decorative motifs inspired by the traditional textiles of Africa and Southeast Asia phase across lushly photorealistic faces and figures reterritorialized in the mescaline netherspace of Paschke’s canvas . which is part of Ed Paschke’s official website, still under construction.) 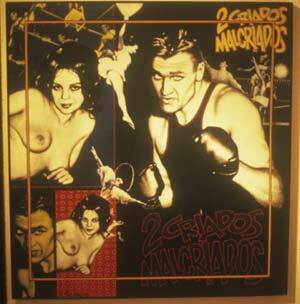 It was left up to a team of artists, including one of Paschke’s sons, to complete his last project. Their final result is wonderful, astounding. 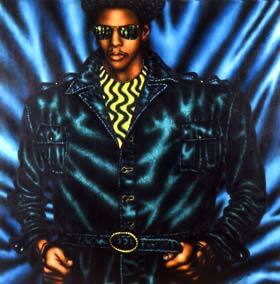 It is the apotheosis of everything that Paschke’s art yearned after. On two large backlit columns, the paintings phase and pulse in a kaleidoscopic aurora of brilliant colors. The threshold of animation has been broken. In his art, Paschke played the role of Dr. Frankenstein, electrifying the reconstructed hybrids of form in search of the material basis of contemporary visual life, performing on canvas again and again experiments that would seem to disprove the existence of the soul but in truth hoped secretly, desperately to discover it. The exhibition at the Chicago History Museum is worth seeing for one’s arrival at these posthumous masterpieces alone. Following Paschke’s work, painting by painting, from its youth to midlife crisis to wise maturity, one begins walking in the rhythm of a creative life, so that one palpably feels the dreadful thud of mortality upon beholding those final colorless ghosts. And so that, upon beholding their gorgeous resurrection, one shudders at the momentary grasp of the perfect ecstasy of eternal life.